Houghton Mifflin Harcourt, 9780544098268, 256pp. 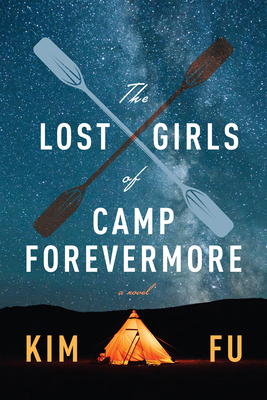 The Lost Girls of Camp Forevermore traces these five girls—Nita, Andee, Isabel, Dina, and Siobhan—through and beyond this fateful trip. We see them through successes and failures, loving relationships and heartbreaks; we see what it means to find, and define, oneself, and the ways in which the same experience is refracted through different people. In diamond-sharp prose, Kim Fu gives us a portrait of friendship and of the families we build for ourselves—and the pasts we can't escape. "A gripping survival story about the lives of six diverse women...The fascinating thing about the book is clocking the ways this traumatic experience in the woods touches each woman's life...Though the tragedy and subsequent fallout at Camp Forevermore affected each woman's life differently, and though their lives diverge as often as they intertwine, they share a resilience Fu embeds into the structure of her sentences. She builds them short, clean, and straightforward. This consistency gives her the ability to drop an extremely intense image or profound line out of nowhere, create convincing cliff-hangers, or slowly increase the stakes of a scene until you feel like a frog in suddenly boiling water. But the great achievement of the novel is the way Fu renders her characters. These portraits of sisterhood, motherhood, daughterhood, wifehood, girlfriendhood, independent womanhood, and other female-identified-hoods sing and groan and scream with complexity and nuance, and they make me want to read her next ten books." "So beautifully done, so thoughtful....Each voice is so present & distinct. I would read another book just like it if I could." "Fu's characters are rich, real, and distinct...With rawness and objectivity, Fu depicts the women these girls become along with their struggles, both cosmic and mundane...An ambitious and dynamic portrayal of the harm humans—even young girls—can do." "Sharp...Readers will delight in the complicated, brash, ugly, and sincere presentation of Fu’s characters." "For readers interested in evolving friendships and stories that move forward and backward in time, this book is sure to be a hit." —Bookish, "Winter 2018 Fiction Preview"
"A vivid and haunting story of lives interrupted by tragedy. The Lost Girls of Camp Forevermore maps the journey from girlhood to womanhood, radiating both nostalgia and hope." “Kim Fu has woven a story both expansive and intimate, charting the ways that five women who meet briefly as children will ultimately haunt one another for a lifetime. As in her first novel, she writes with a fierce, unflinching clarity about the myriad small guilts, cruelties, frailties, and betrayals we all carry with us. This book is one you won’t soon forget." "A startling and clear-sighted examination of the way a single event between children can become a galaxy of trauma, fate, and wonder that spins all the way through adulthood. The Lost Girls of Camp Forevermore is a thoroughly compelling story, and Kim Fu is an assured and intelligent guide."